If you are looking for a simple Spanish program that you can use with all of your children at the same time, stay tuned! 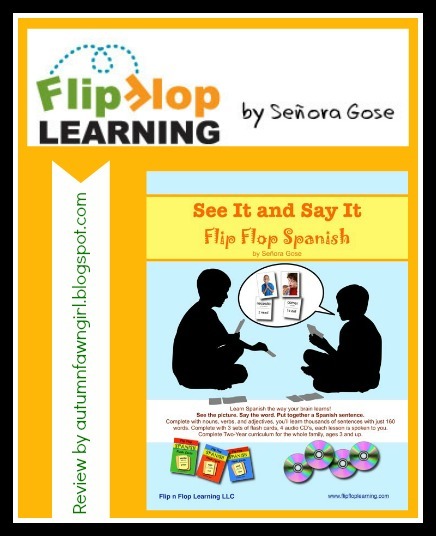 Flip Flop Learning sent Schoolhouse Review Crew Members their See It and Say It Flip Flop Spanish curriculum developed by Señora Gose. What is See It and Say It Flip Flop Spanish? 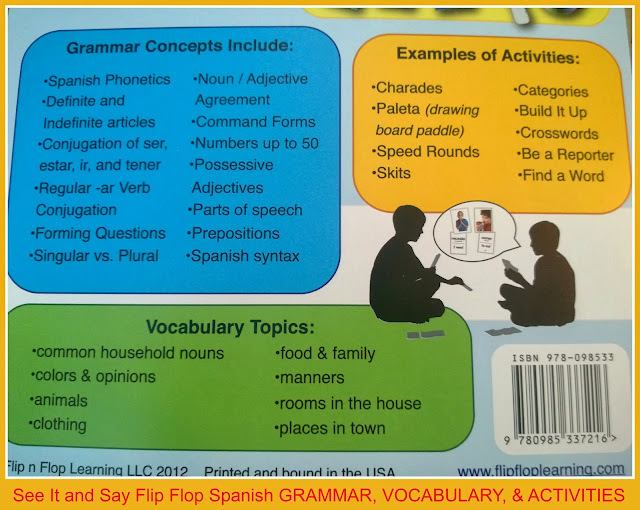 See It And Say It Flip Flop Spanish is a two-year, hands-on Spanish curriculum designed for the entire family, ages 3 and up. You and your family can learn the way your brain was designed to learn: See the picture, say the word, and put together a Spanish sentence. By listening to the lessons on the CD's and by using the colorful flashcards, you will learn thousands of sentences with only 160 words. Since all three learning styles - audial, tactile, and visual - are used, you can effectively learn to speak, understand, read, and even write in Spanish. 150-page teacher's manual divided into 4 semesters. Forty-five lessons in all. Three sets of flash cards - 135 cards total. Even though this program is very simple, you and your children will learn many helpful grammar tips along the way to ensure that you are speaking correctly. And writing correctly, too, if your children are old enough to do so. Vocabulary words are common and familiar. There are a variety of nouns, adjectives, and verbs so you can make lots of sentences with your flashcards. We've also been instructed to make a few of our own cards so we can have conjunctions, prepositions, and linking verbs to work with. After finishing the first 5 lessons, my children would have no problem making and saying this sentence: "Necesito la cuchara y el tazon con el helado." If they ate too much, they might say, "Me duele el estomago." Translation: I need the spoon and the bowl with the ice cream. My stomach hurts. During each lesson, you and your children will have fun completing a variety of activities after learning your new words. While having fun, concepts are reinforced through these activities. So far, my daughter's favorite is using the paleta (paddle) to play Pictionary. Before beginning the lessons, you will be able to see a Quick-Look Guide which shows all 45 lessons at a glance. Lessons are divided into 4 semesters with break weeks factored in. Older children could move along much faster if they wanted to. The program is as flexible as you want it to be! Next, you will read instructions on how to use the program. Finally, you will learn what Spanish vowels sound like and 10 helpful conversational phrases. This Spanish Enrichment Page accompanies track 31 on CD 4, and the whole family can join in at this point. Familiarizing yourself with these first few pages will get you off to a great start! Beginning the lessons is super easy! There are three simple steps to follow: (1) Read the teacher's manual for the day's lesson, (2) Pick out the flashcards for the lesson, and (3) Listen to the lesson on the CD and follow the directions you hear. Lessons take about 8 - 15 minutes to complete each day. There's really not a lot of preparation; on day one I look at the beginning of the lesson right before Spanish class to pick out the cards we need for the lesson. You will only need about 4-6 cards per lesson. 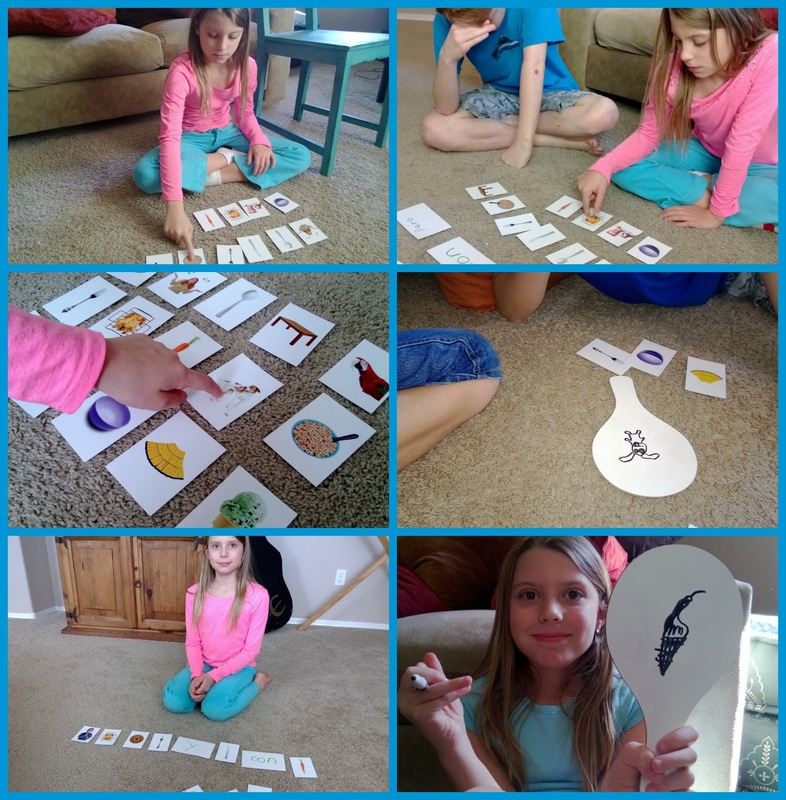 The program is designed to be used 3 days per week, so my 2 kids who are using the program chose Tuesdays, Wednesdays, and Thursdays to do Spanish. On days 1 and 2, we listen to the CD, and on day 3 we don't use the CD per the manual's instruction. The parent is supposed to take the place of the CD, so it's just you and your children interacting on day 3. The lessons are simple, so this task is not hard at all. All lessons begin the same. We lay out the correct cards picture-side-up in the order in which they are listed in the manual. Señora Gose calls out the Spanish words while we touch each card and repeat each word. Then we do the activities as we continue to follow along with the CD. We've made it to lesson 6 during the review period, and we plan to keep on going until we get to the very last lesson! I thought I'd mention, too, that other Spanish words are learned throughout the lessons that are not part of the flashcards. Señora Gose says phrases like, Buen trabajo, Te toca a ti, Solo tres mas, ect. Even though these phrases are not on flashcards, they are written in the manual. So, you are constantly picking up more Spanish just by reading the manual and listening to the lessons. I love that the lessons are brief. Plus, each lesson is split into more than one CD track so you can repeat information quickly and without frustration. Being highly visual, I like that the words are associated with quality, picture flashcards. I like that we are learning the same concepts together, too. While my son could definitely move at a faster pace, I think we will stick with our current schedule. It's doable! I think my son (sixth grade) likes the fact that this Spanish curriculum has less work than his other one. Even though I make him write sentences in a notebook during the lessons, it's still easier (so far) than what he is used to. I'm sure he could potentially get bored with our current pace, but I don't think he really wants to move ahead on his own. Overall, I think this is a great Spanish program for the whole family to enjoy together. Certainly one child could easily do it on his/her own as well. You can purchase the See It and Say It Flip Flop Spanish curriculum on the website for $99.95. (Retail $129.95) Orders of $45.00 or more receive FREE shipping! Can you also get this for Chinese? In any particular Language Vocabulary are words. The key part of any Language is to learn and understand its vocabulary. To be a successful reader, you must have enough knowledge of vocabulary, so learn more and more vocabulary words to become better reader. There are many easy ways to learn English vocabulary, some are playing online games, reading books, singing songs and using hands-on activities. https://vocabmonk.com also helps to enhance and build your vocabulary. Lets start learning..! !